A picture today in Aljazeera of the Green Square (1) in Tripoli struck me, it had a caption “People gather near a portrait of Gaddafi in Tripoli’s Green Square on Friday, before the explosions [Reuters]”. This news picture showed a huge street painting or print of Gaddafi and what seems to be a dwindling crowd around it. There is a fence around the picture that must be something like 50 by 250 meter in size. On the inside of the fence once sees guards posted at regular intervals. 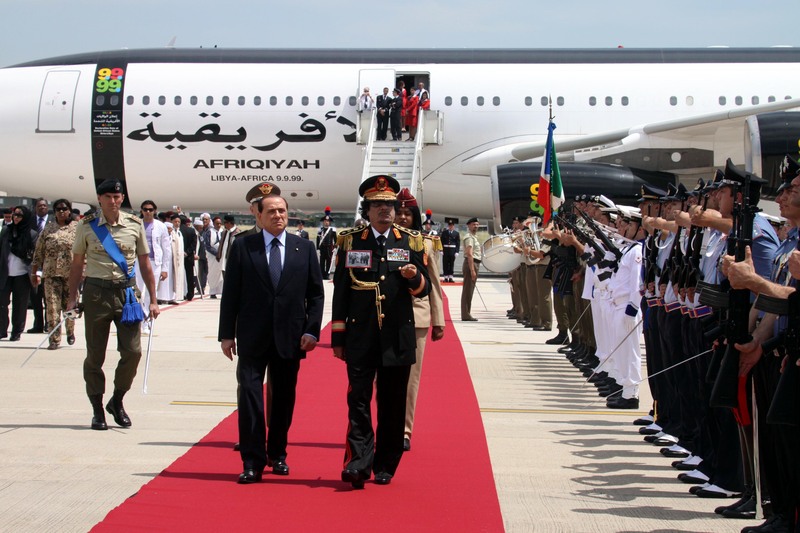 The picture shows Gaddafi in one of his hundreds of outfits, possibly the uniform of an air marshall he wore when visiting the Italian president Berlusconi in June 2009. On the right side of his uniform jacket Gaddafi wears a gallery of medals and on the left the a photograph has been pinned on his uniform. The photograph shows the martyr of Libyan resistance Omar Mukhtar, the “Lion of the Desert”, on the day before he was hanged by his Italian colonial masters in 1931. A provocative statement for his host Berlusconi, who hugged him nevertheless as he was about to make some big business deals with the Libyan leader. The people around the fence at the Green Square in Tripoli in July 2011 look at the picture of this moment of theatrical revenge on the former colonial power, a picture that shows the leader completely, from his golden adorned cap to this shoes, with a saintly light blue glowing aura all around him. If one would not trust the strict editorial rules of Aljazeera and Reuter’s photo agency, it could have been a photoshopped picture. 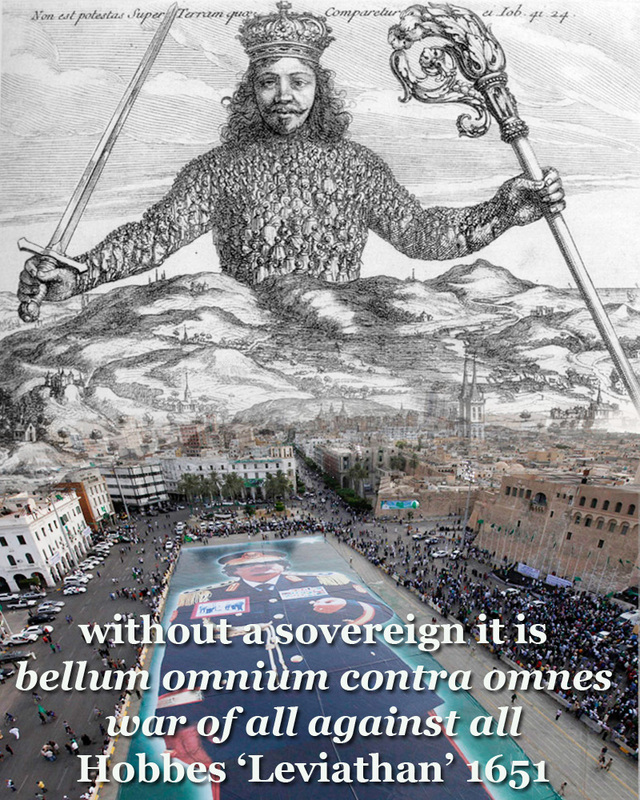 This made me think of the frontispiece of the book by Thomas Hobbes “Leviathan” published in the mid 17th century during the English Civil War, which describes the necessity of a sovereign authority to be accepted by all, to avoid ‘the state of nature’, everybody for themselves, a ‘war of all against all’ (Bellum omnium contra omnes). For the sake of peace, the people, so did Hobbes argue, had to make a social contract with an absolute ruler, best in the form of a king. The ruler in 1651 is depicted as an embodiment of ‘the people’. There is a crowd that marches from a landscape into the body of the ruler. The ruler has a sword in one and a crosier s used by priests in the other hand, showing he is in command both of state and church. The display of the picture of the ruler as if he was a landscape, one could walk in, at the Green Square in Tripoli, has a similar function: Gaddafi as embodiment of the Libyan nation. Only, the aerial photograph unveils that it is but a meagre crowd assembled around their leader. It expresses how the maximum leader has inflated himself disproportionally to the feelings of embodiment by ‘his people’. In mathematical terms one can even speak of an ‘inverse proportionality‘, the more his popularity shrinks, the bigger his pictures. The 17th century theory of state of Hobbes can still be used today, to understand the prolonged rule of dictators. There is some form of common interest, expressed in a social contract, by the ruler and his subjects. (2) How such a two dimensional state of affairs – ruler and ruled – may become a more diverse structure where more people can participate in the affairs of state, is apparently not well understood. The attempts of outsiders – like the Western coalition forces under NATO command – to kill the ruler have failed until now. Aerial bombing, even under the title of a UN mandate to protect civilians from attacks by their own ruler, are counterproductive. To deliver the idea of democracy to a nation does not work, or at least it takes many generations to wear off the effect of long distance destruction perpetuated by outside forces in one’s own country. (3) Interventionist regime change – as we witness for a few months now – does do little to empower the common people. Meanwhile, the ranks of the opposition forces are more and more filled with former supporters of the Gaddafi regime that try not only to evade the eminent purges after Gaddafi’s downfall, but also are preparing to continue the old rule, hidden under new revolutionary slogans. The inflated picture on the pavement of the square of revolution in Tripoli of the dictatorial ruler Gaddafi, serves more than one purpose. It glorifies him and at the same time it shows him as an ancient non-heriditary king who knows his days are counted when he hears the song in the streets: “the king must die“. (4) The ruler as scapegoat to cleanse the history of a nation. The ‘effigy of Gaddafi’ may serve an extra purpose, as a painting to be trampled on by thousands of feet in a direct release of anger , thus avoiding or diminishing the acts of revenge that accompany any change of regime. (2) This phenomenon is explained in another way one century earlier (1548) – and with more foresight – by Etienne de la Boétie in his “Discours de la servitude volontaire” (The Politics of Obedience: The Discourse of Voluntary Servitude). Boétie notes that “…the best and most virtuous man would not remain so if he ruled alone…” See also the study of David Lewis Schaefer “Freedom over servitude: Montaigne, La Boétie, and On voluntary servitude”, page 40, partly available at GoogleBooks.